I started to use Visokio to export my reports, but I can not calculate row count when I aggregate data. 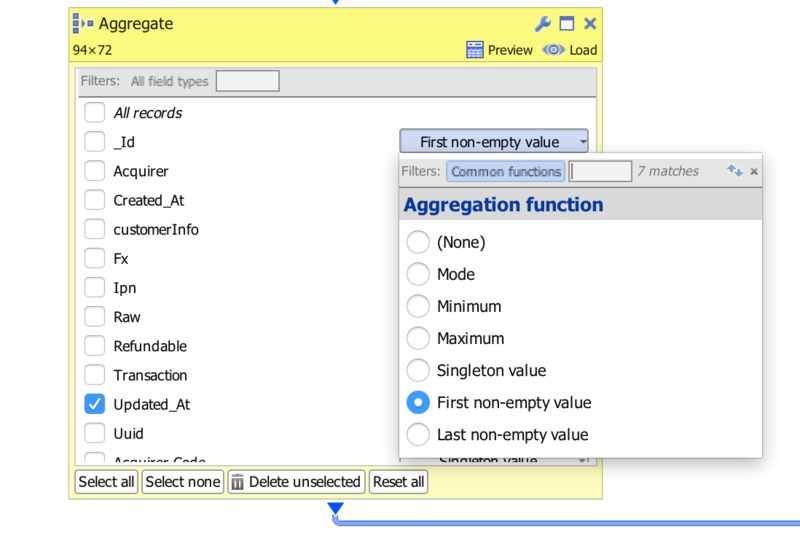 If your ID field is entirely unique, select unique value count on that field in the aggregate block, otherwise just select non-null count. but I can not select unique value in list. Can you see screen shot? If you can spare a new field for this purpose - add CURRENTROW as formula field, then on aggregation pick Max as function. Should I do same screen shot? Might be faster if we do a screenshare - please send your contact details to support at visokio dot com (Skype/tel/Hangouts). Click on where the aggregate says "common functions" and switch it to "all functions", it should be on that list, there is far more options there. Best thing to do is create a new field with initial value as 1 (named 'no of rows' for example), and then sum the field in the aggregation. It's the least taxing way to calculate number of rows through aggregation I have found.